2 pages, circa 1' 30"
"Westphalia's not ham's best measure." The original text is from Busch's collection, Schein und Sein. For other settings of Busch's poems, click here. The parallel fifths in opening diatonic runs introduce a clear major tonic, upwards to "cut" and down again as a "scream." 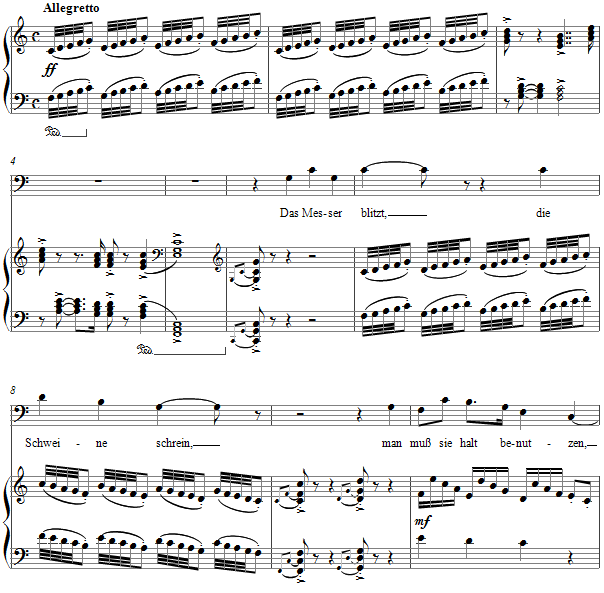 A middle section is more lyric and hymn-like, four-square and in sequences until a final brief restatement of the opening, reminding that yet again, "Das Messer blitzt!" The score for Bis auf weiters is available as a free PDF download, though any major commercial performance or recording of the work is prohibited without prior arrangement with the composer. Click on the graphic below for this piano-vocal score.